A few kilometers north of Bangsak beach, lies the recently 'discovered' jewel of Kho Khao island (ie Ko Kho Khao) with some up market resorts. This quiet and serene island is a few kilometers from the regional (non-touristy) town of Takuapa. Access to the island is via a small car ferry ride (10 mins) from the village of Baan Nam Khem, just south of Takuapa. Pedestrians can also use longtail boat taxis. 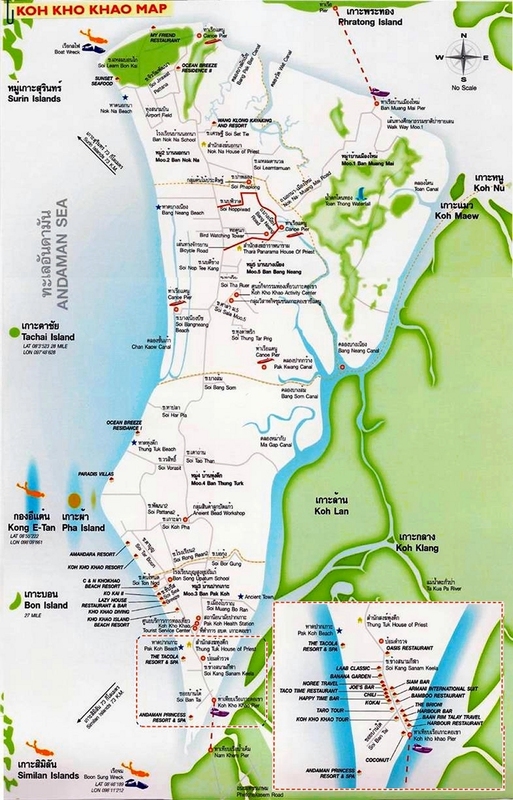 Some brochures and newspaper reports now often associate Kho Khao island with the general Khao Lak area. Ko Kho Khao is a fairly large island characterised mostly by flat, grassy sand flats towards its centre and a sprawling area of mangroves and canals to the east. There are also some rubber plantations and Cashew nut plantations. Beautiful beaches fringe the western and northern coasts. A good sealed road runs the entire north south length of Ko Kho Khao, and most of the other points feed off this main conduit. In addition to the lovely peaceful beaches, some kayaking expeditions are offered in the canals, and there are bird watching tours in the north. There is also an elephant camp near the shore, and an old WW II airstrip to the north. The people on the island are very friendly and live a simple life in harmony with nature. There is a rather basic Health Care Centre, a Childrens School and a simple Buddhist Temple on the island. Visitors can explore the island by motorcycle. There are a few accomodation resorts which can provide mini sightseeing tours around the island. During the 14th - 15th Buddhist century, Kho Khao island was famous and well known. Traders traveled by junk from Arabian countries, and made a stop over at Kho Khao Island because the island's geography made it a good shelter against any adverse weather in the monsoon season. The small ancient city on the island is called "Baan Tung Tuek", and is in the process of being restored as an important historical attraction. The name Ko Kho Khao is pronounced very approximately as "kaw koe cow". But strictly speaking the word "Ko". meaning island, (sometimes also spelt koh) is pronounced more like "got" but do not pronounce the "t". Kho Khao literally translates to his neck. 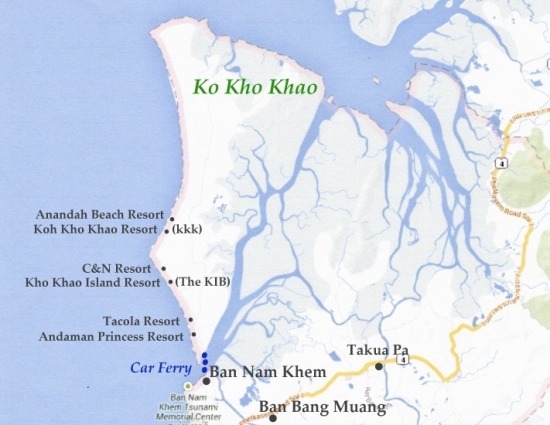 So Ko Kho Khao simply means "(his) neck island". According to history, in the year 2448 BE, during King Rama V's reign, the city of Ko Kho Khao was set up. Other administrative changes took place in the years 2456 BE and 2509 BE. There was apparently a governor called Mr Kho Khao King, and the island was also called king island. 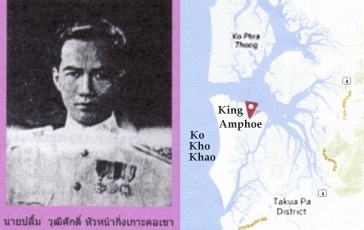 Amphoe King Ko Kho Khao is in the north east of the island. There is archive data on the affairs of Ko Kho Khao and the king island district court in 2509 BE. In those days the administrative area covered 932 sq km and included the island of Ko Phra Thong. In addition, if one looks at the map of the two islands and the waterway between them, one can appreciate how the name (his) neck island (or throat island) came about. The car ferry is supposed to operate every hour on the hour from 07.00 hrs to 18.00 hrs daily, (ie daylight hours only) come rain or shine, high season or low season. The last ferry "from" KKK Island is at 17.30 hrs. The one way price is 150 baht - this includes the car and the driver and all passengers. The payment is made on the boat. 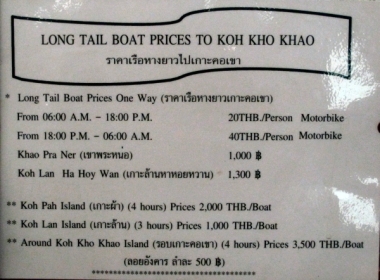 There is also a frequent longtail boat service, from 06.00 hrs to 18.00 hrs, for foot passengers and motorcycles.